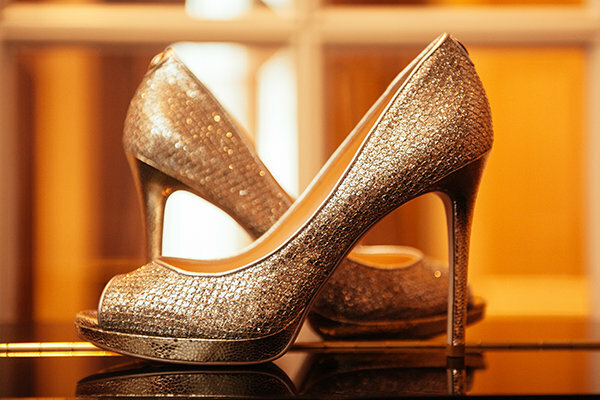 Your wedding is your time to shine — gold or silver-hued shoes lend a luxe touch to any bridal ensemble. Try on-trend iridescent textures or up the comfort factor with thicker straps and a platform heel. The latest neutrals were made to stand out as opposed to blending in with eye-catching elements such as crisscross straps, ruffles, bows and more. Shop for a shape that fits your everyday style M.O., from sleek, pointy-toed pumps to sultry gladiator booties to beach-ready wedges. Stun from every angle thanks to crystal-encrusted straps, Art Deco-style brooches or T-strap embellishments. Post-wedding, these shoes are great for adding a little sparkle to an otherwise simple outfit. As brides have become more adventurous with their wedding color palettes, footwear has followed suit. Rich jewel tones such as cobalt blue, plum, cherry, and emerald not only stand out in a sea of ivory but also add a fun pop of color to your newlywed wardrobe as well. More brides are eschewing sky-high heels in favor of down-to-earth flats for their big day. Whether you want to kick it in cowboy boots, bejeweled sandals, loafers, or even sneakers, your toes will certainly thank you! Custom hand-painted shoes are a sentimental wedding memento that we're seeing more of, and although you may not be able to wear them as often as other types of shoes, they're so special that we had to make an exception and include them in our round-up. Keep it simple with your names and a few illustration motifs to ensure you can repurpose them again for something else (say, your wedding anniversary! ).